Stops motor noise in minutes or free! Say "good bye to motor noise. Say "good bye" to motor noise like the following - for good, with the Mega Power Worn Motor Treatment. Mega Power ends valve tap, carbon knock, stuck valve lifters, ping, noisy valve train, and engine backfire. That is how to get your motors like-new quietness back again! Just Pour-in Mega Power as directed - driving ends the cause of noise in minutes or free. Here's is why the treatment works so fast. Six cleaners - each goes to a specific noise producing area. Any man or women car/equipment owner can install the treatment. Directions and phone help included. 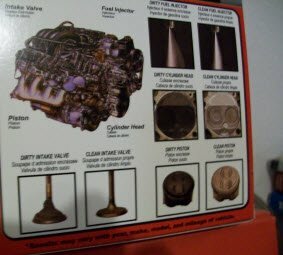 These six are what works for the six causes of your engines noise. Your motor may have one or more causes - of noise. Four perform special kinds of cleaning for four different motor noise problem areas. One of the six Mega Power ingredients modifies friction - to end that cause of noise. One other Mega Power ingredient works to end the other cause of engine noise. This ingredient also adds a slippery coating to fills worn spaces so binding and sticking - those causes of noise stop. These pictures gives you an idea of what Mega Power does to end - your motor problem and restore its smooth, quiet, like-new dependability again. Customers tell us repair estimates Mega Power avoids run $1600 to $3000. Mega Power Cost under $100 - a huge savings. Any of the links on this page provide details and ordering info. Our Guarantee. If not satisfied and does not do as advertised - your money refunded. Shipped by FedEx to you in about 3 days.